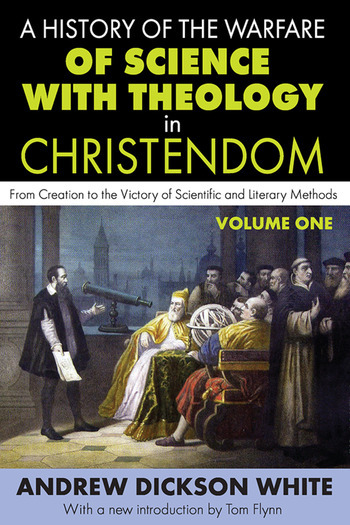 Given the powerful and forthright title of Andrew Dickson White's classic study, it is best to make clear his own sense of the whole as given in the original 1896 edition: "My conviction is that science, though it has evidently conquered dogmatic theology based on biblical texts and ancient modes of thought, will go hand in hand with religion, and that although theological control will continue to diminish, religion as seen in the recognition of a 'power in the universe, not ourselves, which makes for righteousness' and in the love of God and of our neighbor, will steadily grow stronger and stronger, not only in the American institutions of learning, but in the world at large." White began to assemble his magnum opus, a two volume work first published in 1896 as A History of the Warfare of Science with Theology in Christendom. In correspondence he wrote that he intended the work to stake out a position between such religious orthodoxy as John Henry Newman's on one side and such secular scoffing as Robert Ingersoll's on the other. Historian Paul Carter declared that this book did as much as any other published work "toward routing orthodoxy in the name of science." Insofar as science and religion came to be widely viewed as enemies, with science holding the moral high ground, White inadvertently, became one of the most effective and influential advocates for unbelief.